Ranger Johnson was honored for his work on the Buffalo Soldier program in the park which is designed ultimately to diversify access and support for national parks and forests throughout the country. Johnson's program "Yosemite Through the Eyes of a Buffalo Soldier" is presented regularly throughout the park and at venues throughout the country. 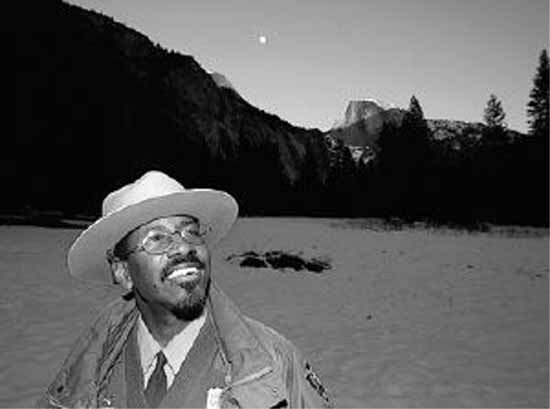 Yosemite National Park Ranger Shelton Johnson was presented the Cultural Heritage Award by the Center for Law in the Public Interest at their 34th Anniversary Dinner in Los Angeles, CA on June 30, 2005. "We are tremendously proud of Shelton and the work he has done through the Buffalo Soldier program", stated Yosemite National Park Superintendent Michael J. Tollefson. He continued, "Shelton's work has brought this little known piece of history to light to thousands of park visitors and to people across the country." Johnson has been a National Park Ranger since 1987. In addition to Yosemite, he has worked at Great Basin and Yellowstone National Parks and parks around Washington DC. Johnson is a native of Detroit, Michigan. He served with the Peace Corps in Liberia, West Africa, and attended Graduate School at the University of Michigan, majoring in Creative Writing. The Buffalo Soldier Program, conceived, written, and presented by Ranger Johnson is intended to give an insight into the African American infantry soldiers of the U.S. Army who patrolled Yosemite and Sequoia National Parks before the creation of the National Park Service. The soldier's duties included patrolling boundaries, enforcing park rules, and patrolling park trails. These soldiers were truly park rangers before there was a National Park Service. This adds special significance because it counters the common perception the African Americans played no role in the founding of our great national parks. In addition to the Cultural Heritage Award, Ranger Shelton Johnson received certificates and commendations from elected officials from the Los Angeles Area and members of the United States Congress.